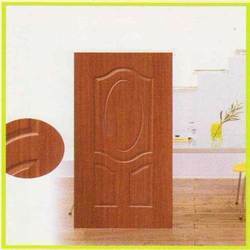 ELEGANT also offers Melamine Moulded Panel Doors. These doors are manufactured from selected imported HDF melamine door skins. They are integrated with melamine decorative papers under one mould process under high pressure and heat. Melamine moulded panel doors exhibit a natural wood grain texture almost replicating real solid wood and are pre-finished. These doors do not require paint or polish and are low on maintenance and easy to install. Height	: 78" to 84"
Width	: 26" to 40"
Om Interior Gallery Trader, Distributor & Supplier of Flush Doors, Engineered Veneer Doors, Moulded Panel Doors, Decorative PVC Doors, Engineered Wooden Panel Doors, Fire Retardant Doors, Door Frames & Door Jams, Modular Kitchen & Wardrobe Shutters, Block Boards & Plywood, with a rich experience 8 years in timber & its by - products. The vast acceptance of the products by demanding architects, builders & end consumers is a testimony to its unrelenting commitment to quality products & processes. The company is privileged to be associated with World's leading manufacturer of Moulded Door Skins, M/S Masonite International, USA, as their authorized assembler & M/S Promat of Belgium, the world leader in Fire Systems as their OEM partner for the manufacture of Fire Retardant Doors with Wooden Frames. Our pursuit has been to offer products of international standards to meet local climatic conditions.